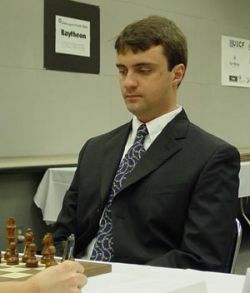 Alex Stripunsky of Queens, NY leads the World Open (June 28-July 4 King of Prussia,PA) with a perfect score and a fourth round victory over Eugene Najer. The four and seven day sections are so top-heavy that GMs outnumber non GMs- the seven day has eight GMs out of 12 and the four day has eight of out ten! There was talk that only Hikaru Nakamura and Leonid Yudasin would play in the three day, causing a Nakamura-Yudasin mini-match. The Open sections are much smaller than usual because of the popular, new U2400 section. Black should play 51...h3! here, tying the e1 rook to the back rank in light of h2+ (if Kxh2 g1=Q, if Qxh2 Qc1+) Instead Najer played 51...Qc3? and Stripunsky uncorked: 52.Qxc7!! when Qxc7 e7 h3 loses to e8=N! The U2400 section gives players rated 2200-2400 a great chance to play for the big money. For instance, Craig Jones of North Carolina tied for first in the new U2300 section at the Chicago Open. This week at the World Open, he started 3-0 in the U2400, and is making another run for the big money! GM Hikaru Nakamura analyses with one of the U2400 leaders, Craig Jones. There is only one game at 6 PM on Monday, July 2. The tournament wraps with all sections merging on the final two days. On July 3, rounds are at 11 AM and 6 PM and on July 4, 10 AM and 5 PM. Watch live games and access standings at Monroi.com.